By the end of June 1910, the season was beginning to take definite form in both leagues. There were few surprises, although the American League had a big one. Here’s a look at the way Major League Baseball stood at the end of June 1910. The National League was running true to pre-season expectations. The Chicago Cubs were in first place with a record of 38-21. They were 1.5 games up on the New York Giants, with the defending champion Pittsburgh Pirates another4.5 games back. Cincinnati rounded out the first division 8.5 games back with a .500 record (30-30 with one tie on the books). The Phillies, Cardinals, and Brooklyn Superbas were bunched closed behind the Reds in position to step into the first division. The Doves of Boston were already mired deep in last place 18 games out of first with a record of 22-41 (with a tie). Honus Wagner was on track for another batting title, but Philadelphia outfielder Sherry Magee was having a monster year and already ahead in the RBI department. The big surprise was in the American League. 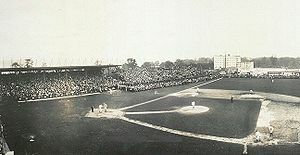 Philadelphia was a game ahead at the end of June, but second place belonged to the New York Highlanders (now Yankees). The Highlanders finished fifth in 1909 and were not favorites for a pennant in 1910. But manager George Stallings (of 1914 Miracle Braves fame) had them in contention. They led the AL in stolen bases and Russ Ford was striking out a lot of batters. Unfortunately for the Highlanders, manager Stallings was already having problems with first baseman Hal Chase, who seemed not to be trying very hard to win games on occasion. It was to be a career long problem for Chase’s managers. It helped the Highlanders, that the Athletics had a terrible June. The A’s went 12-12 for the month (unfortunately the Highlanders only went 13-11 for the month), their worst month of the season. Chief Bender was doing alright on the mound, but ace Eddie Plank was off his game. Jack Coombs was doing OK, but nothing special (his time was to come later in the season). Both the Tigers defending AL champs) and Red Sox were in range of first (3 and 6 games out), but had yet to make a charge. The second division teams, Cleveland, Chicago, Washington, and St. Louis, were falling back, although Senators pitcher Walter Johnson was having a decent first half. So except for the Highlanders, the season was playing out about as expected. There were three months left (plus a handful of October games) to sort out the winners, but other than the AL’s New York team, there were no surprises. Of course, it was only half a season and a lot of things could change. In July there will be a couple of major developments that will be dealt with on the appropriate date. He is one of the most famous shortstops in the history of baseball, primarily for a piece of bad poetry that begins “Tinker to Evers to Chance.” Despite not having played a game outside baseball’s Stone Age, Joe Tinker is still known, if only vaguely, because people know that single line. But today marks the centennial of Joe Tinker doing something no other Major Leaguer had ever done. On Tuesday, 28 June 1910, in an 11-1 romp over Cincinnati, Tinker became the first big league ballplayer to steal home twice in a single game. Over a career lasting from 1902 through 1916, Tinker played 1806 games, all but 267 with the Chicago Cubs. He managed to hit .262 with 2273 total bases, 263 doubles and 114 triples. His OBP was .308, his slugging percentage was .353, giving him an OPS of .661. He stole 336 bases (including the two on this date one hundred years ago) and walked 416 times. In 1914 and 1915 he played in the Federal League, hitting about what he hit for his career. He managed the Federal League Chicago Whales to second place in 1914 and then won the Feds pennant in 1915. In 1916 he took over the Cubs manager’s role and led them to fifth place, a spot down from their 1915 position. He was let go and the Cubs remained in fifth for 1916. He played in four World Series’, all with the Cubs. He was part of a winning team in 1907 and 1908, and suffered losses in 1906 and 1910. He didn’t do particularly well in World Series play, hitting .235 with one home run, seven stolen bases, and 21 total bases. His best Series’ were 1908 when he hit the home run, slugged .421, and had four RBIs; and 1910 when he hit .333, slugged .444, and had two doubles. Over the years, because of the poem, he’s become most famous for his fielding. It’s also become common to deride his fielding as nothing special. His fielding numbers certainly aren’t bad for the era, but Honus Wagner he isn’t. It is, however, wrong to deride his contribution at short. He finished first in assists by shortstops three times and second another three. He was also first in errors once and second a further two times. His range factor was consistently in the top four shortstops and led the league three times (plus once in the Federal League). He still ranks 38th in defensive games as a shortstop. I think a lot of the problem people have with Tinker is that he’s in the Hall of Fame. His numbers aren’t bad, but to single him out for the Hall is a bit much for most people. He was elected to Cooperstown in 1946 by the “Old Timer’s Committee” (We now call it the “Veteran’s Committee”, which has a nicer ring for us old timer’s.). Prior to his election he’d not gotten a lot of support among the writers, but was steadily climbing the ladder, peaking at 27.2% in 1946, the year the Veteran’s Committee put him over the top. I’m not sure Tinker really deserves enshrinement in Cooperstown. Maybe he does; maybe he doesn’t. And I guess that says a lot about what I truly think. It seems to me that there should be no question about whether a player is in the HoF or he isn’t, so if you have a question, then he’s probably not someone who should, in your opinion, be there. Now I don’t mean to imply by that comment that all of us will question the same people or agree on the same people, only that if you have a question in your own mind then you probably deep down inside don’t think the guy ought to be honored. For me Tinker is one of those. Having said all that, I’m still glad he’s remembered. 1. They put the team name on the jerseys. You get back from running an errand and flip on the World Cup game a minute or so late and what does the congregation see? You see two teams running around without team names on their shirts. Guess which is Italy and which is France (they both wear blue). Come on guys, splash a great big “Italia” across the front so us late comers know who we’re watching. It can’t cost that much, team. In baseball they put Red Sox right on the front so you know who it is. 2. There is no stoppage time. What the heck is stoppage time? You play 90 minutes, then you play more and you never know how much more until you get to the more? Then if there’s stoppage in stoppage time you add more stoppage time? Say what? In baseball it’s nine (count ’em) innings whether you stop or not. 3. There are no Own Goals. You can’t score against yourself in baseball. 4. Soccer has a level playing field. Baseball has a mound. 5. You gotta win to go forward. If you’re tied with another team in soccer they use goal differential to determine who gets to play next week. Goal differential? In baseball you have two teams tied for a playoff berth, they play each other and the winner goes forward, not the team that scored the most runs in other games. The Dodgers end the season 90-62. The Mets (just for you, Bill) end the season 90-62. The Dodgers score 1000 runs, the Mets 800. So what? Kershaw faces Santana for a one game shot at the playoffs. 6. Every pitch matters. Throw it over the plate it’s a strike or it’s hit. Throw it outside it’s a ball. In soccer half the kicks go backwards. Kick it back toward your goal and it’s just a kick toward your goal. Somebody in the congregation said they’re setting up a play. Not always, sometimes it’s just a do over. Come on, soccer, put the ball down the field, anywhere down the field. 7. What’s with this two games and aggregate score nonsense? In too many soccer leagues the teams play a home and home in their playoffs and the aggregate goals decide who wins if the teams split. In baseball you gotta win 2 of 3, 3 of 5, or 4 of 7. At least you gotta win more games. 8. You get to use your whole body in baseball. God gave you hands, brothers and sisters, use ’em. 9. There’s no tying in baseball. You don’t have a winner in nine innings, you play more until you win. Try that in the first round of the World Cup. So there you go, team. Can I hear an “Amen”? I can’t believe I’m doing two posts in a month that involve Jamie Moyer, but I am. Last night he set one of those records that you look at and try to figure is this good or bad. In case you don’t know, he’s now given up more home runs than any other big league pitcher. That sounds bad, but think about how good you have to be to stay around long enough to give up a record number of home runs. It’s the kind of record that sums up the contradictions of Moyer’s career. He has 266 wins (a .570 winning percentage). That’s tied for 34th ever. Let me try that again, 34th ever. I didn’t realize that until I looked it up. Bet you didn’t either. Of the several gazillion men who have pitched in the Major Leagues, only 33 have more wins than him. He has eight wins in half a season. Double it and he’s 31st ever, and 10 from the top 30. I know a lot of stat geeks say wins are overrated, but you know what, that’s not absolutely true. You know who doesn’t consider them overrated? The Hall of Fame voters. The last starting pitcher elected by the writers to the Hall without 300 wins was Ferguson Jenkins. That was in 1991, twenty years ago. Since then there have been five starting pitchers elected (and one other in 1991 itself) to the HoF. All have 300 wins. So someone still thinks wins matter. Now that doesn’t mean I believe Moyer’s a Hall of Famer. I merely point out that wins still matter to some people who have a great deal of influence. So let us celebrate Moyer’s record. It’s kind of dubious, but heck, I don’t hold any records. Now if we can just get Tim Wakefield to pitch until he’s 65. I grew up in a small town where I was raised by my grandparents. There was one hardware store in town. As with many small towns of the era, the hardware store doubled as a number of other stores, including the local sporting goods store. My grandfather and a number of his cronies gathered in the mornings around the hardware store to swap stories and argue politics and sports. 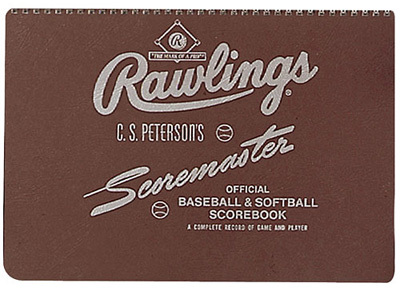 One day my grandfather went inside and bought a score book. It cost fifty cents. Now we never had a lot of money, and fifty cents was a considerable sum back then, but he loved to watch the Saturday Game of the Week on CBS and decided he would keep score. My grandmother was horrified. She was absolutely certain granddad had just bankrupted the family. “It’s a waste of fifty cents,” she told him. She went on about food on the table, taxes to be paid, milk to be bought, my school shoes, and assorted other calamities that were about to occur because he’d just spent fifty cents on a score book. I don’ t remember concerns about the orphans of China, but they may have been there too. I had a different take on the matter. It was one of the most fascinating books I’d ever seen. There were page after page of pages that looked exactly alike with strange markings all over them. I was fairly sure I was looking at some kind of new language that my grandfather would be able to explain to me if I just paid enough attention. Most of you have probably seen these pages. There’s a column where you can place the name of the player. On either side is a small spot where you put the number and the position. This is the first time I knew that a player had two numbers, the one on his back and the position. Then there are 10 or 12 boxes with a diamond inside and assorted abbreviations down the sides. It ends with a place to put game stats like at bats, hits, runs, etc. At the bottom there’s a smaller set of boxes where you can place the names of the pitchers and compile their stats for the game. It was all new and wonderful. I remember the hitters boxes having a diamond inside with the bases marked by small squares. Down the right side were a series of letters with words like BB or K or 1B or HR. On the left side were two sets of blank boxes, one of two boxes, the other of three. At the bottom of the diamond there was a big blank box. This went on for player after player, inning after inning, page after page. My grandfather taught me to score from that book. I knew that 1B had to be a single and that HR was a home run. Those were easy, but then I found out that BB was a walk and that K was a strikeout. I discovered if you put a line through the appropriate set of letters (through the 1B if it was a single) and drew a line from home on the paper diamond to first, you could keep track of what was going on with each batter. I found out that the boxes on the left were for balls and strikes and you could even keep the count. If a man advanced to second you could draw a line to show it and if he scored you simply filled in the interior of the diamond. It really wasn’t that mysterious after all. I still score games and I still use the method my grandfather taught me. Because he marked the K for a strikeout he didn’t use the backwards K for a called strikeout. Instead he used a C (for called). I still note it the same way. A ball was slash, as was a called strike. A swinging strike was an X and a foul strike was a dot (I’ve started putting an F instead of a dot in the boxes as I get older and my eyesight lessens). I still use the bottom box to record RBIs rather than outs and I have the opposite team’s pitchers on the page so I don’t have to turn to another page when a pitching change is made. I taught my son the same system. I’m sure he’s modified it some to fit his needs. I hope he teaches his son to score also, after all, it’s a family tradition and I’d like to think my grandfather didn’t waste that fifty cents all those years ago. The Braves didn’t have a particularly distinguished history in the first half of the 20th Century. They won the World Series in 1914, lost it in 1948 and did nothing in between. In the early 1950’s they left Boston for Milwaukee, picked up Eddie Mathews and Henry Aaron to go with stalwart lefty Warren Spahn, and finally became a pennant threat in the National League. They had a pretty good team by 1957, then center fielder and leadoff man Billy Bruton went down with a knee injury. In crisis mode, the Braves called up an undistinguished minor leaguer named Bob Hazle. It worked. Hazle was from South Carolina, born in 1930. He had a cup of coffee with the Cincinnati Reds in 1955, then went back to the minors where he languished until Bruton banged up his knee. 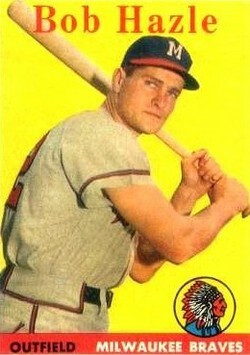 One hundred games into the 1957 season Hazle made his debut for Milwaukee. Over the months of August and September he exploded offensively in such a way as to make fans forget, at least temporarily, both Aaron and Mathews. For the two months he played in 1957 Hazle hit .403 with 27 RBIs and seven home runs over 41 games. It got him the nickname “Hurricane” (a play on his name and the devastating hurricane Hazel which hit South Carolina in 1954) and it got the Braves the pennant. The Braves became the first non-New York team to win the National League pennant since the 1950 Philadelphia Phillies “Whiz Kids”. The Braves won the World Series, beating New York in seven games. Hazle played in four of the games, batting .154. He had two singles, both in game seven. There were no RBIs, but he did score two runs and picked up a ring. The World Series was a sign of things to come. He started 1958 horribly (a buck seventy-nine average and no extra base hits), was traded to Detroit, did a little better (.241 and two home runs), then went back to the minors. He retired after the 1959 season and died in 1992. So he wasn’t much of a player after all. But what a great two months he had. It’s hard to say this about a team that includes Aaron, Mathews, and Spahn, but without Hazle the Braves don’t win. Quick aside: Today marks the 195th anniversary of the Battle of Waterloo. Advice–bet on Wellington. So I see that Jamie Moyer just became the oldest pitcher to pick up a win against the Yankees. Good for him. I remember when he first came up. Frankly, he wasn’t very good. It took him until age 30 to find his place on the mound. Since then he’s won over 250 games. As usual with baseball, he’s not the first pitcher to discover his abilities after he’d become a geezer in baseball terms. Meet Charles Arthur “Dazzy” Vance. Vance was born in 1891 in Nebraska. He made it to the Major Leagues in 1915 with Pittsburgh. He was 24. He also wasn’t anything special. He went 0-1 and was sent to the Yankees, where he was equally bad going 0-3. He went back to the minors, came back to the Yankees for a two game stretch in 1918, went 0-0, then wandered back to the minors. So far he was 0-4 and age 27. He resurfaced in 1922 at Brooklyn, aged 31. He’d spent the years in between gaining control of his fastball. He went 18-12, picking up his first win at age 31. For the rest of his 30s, he was a premier pitcher in the National League. Between 1922 and 1928 he led the league in wins twice, topping out at 28-6 in 1924. He also led the NL in strikeouts every year. His peak was 262, also in 1924. His career year was obviously 1924. He won the MVP. He was 33. 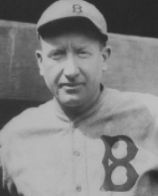 He won two ERA titles, with 1928 being his lowest at 2.09. By 1930 he was 39. It was the year they changed the ball and offenses exploded, especially in the NL. Hack Wilson had 58 home runs and set the RBI record. Bill Terry hit .400. Want to guess who won the ERA title? You guessed Vance, didn’t you? Of course you’re right. His ERA was 2.61, the only ERA under 3.00 among NL starters with 20 or more games. He had two more good years, then his career began to collapse. Of course he was 42 when that happened. There was a trade to St. Louis in 1933. He went to Cincinnati in early ’34, then back to St. Louis to end the season. He went 1-1 in 19 games (only four starts), but got into his only World Series as a bullpen pitcher for the Gas House Gang Cardinals. He got into one game, pitched 1.1 innings, giving up an unearned run and no decision. In 1935, at age 44, he went back to Brooklyn for a final season. He went 3-2 in 20 games, all in relief, then retired. For his career he was 197-140 with an ERA of 3.24. He had 2045 strikeouts to 840 walks in 2967 innings. In 1955 he made the Hall of Fame. He died in 1961. With the possible exception of Moyer, Vance is probably the greatest “old” pitcher ever. He has 197 wins, all after the age of 30. A lot of pitchers have won 200 games after age 30, but they had good, substantial careers prior to age 30. So Vance is kind of unique. By way of comparison among Dodgers pitchers, remember that all of Sandy Koufax’s wins come prior to the age when Vance won his first. Not bad for a geezer, right? So the Big 12 isn’t moribund after all. Whodda thunk it? I know this is a baseball blog and the Big 12 issue was all about football, but the Big 12 also plays baseball. Both Texas and Oklahoma have won the College World Series in the last fifteen or so years. So how do the changes effect the college baseball world? Frankly, not just a whole lot. The Big 10 picked up a football power in Nebraska, but they also got a pretty fair baseball team, sometimes. Off and on over the last decade, the Cornhuskers have proved to be a pretty good baseball university. If they revive, then the Big 10 will be in better shape baseball-wise. If not, well, it shouldn’t hurt. Colorado does nothing for the Pacific 10. When title 9 showed up, Colorado dumped its baseball team to make room and save money. So a league already heavy with teams like Arizona, Arizona State, and USC won’t be either helped or harmed by the advent of baseball-less Colorado. The Big 12 was dominated by five baseball teams: Texas, Texas A&M, Baylor, Oklahoma, and Oklahoma State (although OSU has had troubles the last few years), with OU going to this year’s College World Series. None of those teams is leaving. Of the other five (Kansas, Kansas State, Texas Tech, Missouri, Iowa State) four are not perennial powers and Iowa State, like Colorado, has no baseball team. Currently the Big 12 championship is held in Oklahoma City and includes the top eight qualifiers. That meant two teams (the bottom two) were left out of the tournament. With Nebraska going east, that means only one team will be left out. Interestingly enough, the Huskers finished last this season so nothing would have changed had they gone out earlier. So don’t cry for the Big 12 in baseball. It should do alright despite losing two teams. Now they need to start either picking up two new teams or seeing if they can switch logos with the Big 10 (which now has 12 teams). Normally when I try to wax eloquent about a Deadball Era player, I attempt to find some reasonably obscure one to say things about. This time I want to change that up and talk about a really good player, Tris Speaker. He, with suitable apologies to Eddie Collins, was arguably the third finest Deadball Era player behind only Ty Cobb and Honus Wagner. 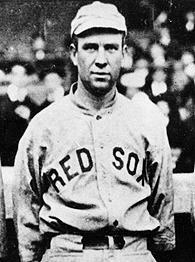 He wasn’t an instant success, hitting a buck 58 in a seven game stint with Boston in 1907. In 1908 he hit all of .220. He was to hit below .300 exactly two more times: 1919, and his final season in 1928. His breakout year was 1910. He hit .340 and scored 92 runs. By 1912 he was teaming with Harry Hooper and Duffy Lewis to win the World Series and establish one of Stone Age baseball’s finest outfields. In the Series he did OK, without being spectacular, and provided a key hit in the final inning of the final game. That same year he won his only home run title (with 10) and led the American League in doubles. His .383 batting average was third behind both Cobb and Joe Jackson. Speaker (nicknamed “Spoke” by this point) had good years in both 1913 and 1914 then got back to the World Series in 1915. The Sox won in five games and he hit .294 with no RBIs. Before the 1916 season Boston traded him to Cleveland for pitcher Sam Jones, infielder Fred Thomas, and $55,000 cash. Chalk it up to lack of money and terminal stupidity (And you thought Boston’s bad trades began with Babe Ruth, didn’t you?). Speaker continued to play well in Cleveland. 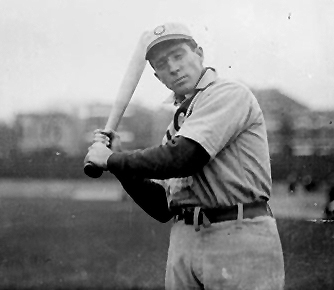 In 1916 he led the league in hits, doubles, slugging and finally won a batting title. In 1919, he became player-manager and, despite a drop in his own stats, guided the Indians to second place. In 1920 they won the AL pennant and the World Series. For Speaker 1920 was a career year and a challenge. He hit .388, at the time a career high (he later hit .389 in 1925), and developed a new platoon system (first base and both outfield corners). He dealt with the accidental beaning and death of shortstop Ray Chapman with class and brought up future Hall of Famer Joe Sewell to replace Chapman. Speaker stayed as player-manager through 1926, playing well and adapting to the post-Stone Age world. In 1927 he went to Washington where he teamed with Walter Johnson in the latter’s final season. His batting was still good, but his fielding was beginning to suffer. Age was slowing him down. In 1928, he moved on to Philadelphia for one final season where he teamed with Ty Cobb (also in his last season). It wasn’t a good year, and Speaker gave up playing when the Athletics season ended. He has chosen for the Hall of Fame in 1937. Speaker is still fifth in hits (and was second when he retired) and is the all-time leader in doubles. That stat has a special kicker to it. He’s 48 doubles ahead of the second man on the list, Pete Rose. That’s farther ahead of the second place guy than the other extra base hit leaders. Sam Crawford leads Cobb by 14 in triples and Bonds in less than ten ahead of Aaron in home runs. Speaker did some coaching and scouting after he retired. There were rumors he joined the Ku Klux Klan at one point. I can’t find a definitive source to verify (or refute) that. He was known for helping newly arriving black players, especially Larry Doby, when integration came to baseball. Maybe he was a Klansman or maybe he wasn’t, but it doesn’t seem to have carried over to his views on baseball talent. Speaker is one of those talents that transcends his era. There are a lot of players that I look at and feel they were great because of when they played. Move ’em twenty years forward or backward and they might be marginal players or even stars, but not all-time greats. Tris Speaker isn’t one of those. His numbers transcend his era. I rate him a top five center fielder ever (Cobb, DiMaggio, Mantle, Mays alphabetically, are the other four). Young phenom pitchers come and go. Some are exactly what you expect, some are even better, some much worse. Stephen Strasburg did OK, but so did another pitcher back a few eons ago. On Saturday, 11 July 1914, the Boston Red Sox were at home against the Cleveland Naps. They were in sixth place in the American League, 5 games out, when manager Bill Carrigan decided to start a new phenom on the mound. The new kid was a left-handed nineteen year old just picked up from Baltimore who was reputed to be pretty good. The Kid took the mound, got the first man out, then managed to pitch shutout ball for six innings. He gave up five hits but no one scored. The seventh inning proved to be more difficult for him. He gave up two more singles. Combined with a sacrifice, they plated two runs for the Naps (the same number of runs Strasburg gave up). Carrigan pulled him at the end of the inning (again the same inning Strasburg left the game). Boston gave up one more run, but hung on to pick up the victory 4-3 and the Kid was the winning pitcher. At the plate he went 0-2 (same as Strasburg). For the season the Kid pitched in four games going 2-1 in 23 innings with an ERA of 3.91. He gave up 21 hits, one a home run, and 12 runs. He struck out 3 and walked 7. At the plate he went 2 for 10 with four strikeouts and no walks. He did manage a double, scored a run, and picked up two RBIs. Not much better than his pitching numbers, but the double and the RBIs showed promise. Manager Carrigan brought him back the next season and left him on the mound. It took a few years and a new manager, Ed Barrow, but the Red Sox finally moved the Kid to the outfield. The Kid, George Ruth, now nicknamed “Babe” did pretty well there. Welcome to the big leagues Stephen Strasburg. May you have a long and productive career. You are currently browsing the Verdun2's Blog blog archives for June, 2010.